These are primarily the states we do business with. Have an order needing to get place outside this region? Give us a call at (800) 248-2099 to see what we can do for you! For over 35 years Southeastern Seating has been providing safe quality indoor and outdoor aluminum bleachers all over the United States. We can accommodate any size event, a modest golf tournament, or small beach wedding to the largest parades in the nation. Southeastern is centrally located in Tampa but moves bleachers all over the southeast. We pride ourselves on being able to provide service to numerous events: rodeos, raceways, high schools and universities to name a few. Customer care and satisfaction are our top priorities. With such a large inventory no one can match Southeastern’s long term pricing. How do we keep our costs so low? 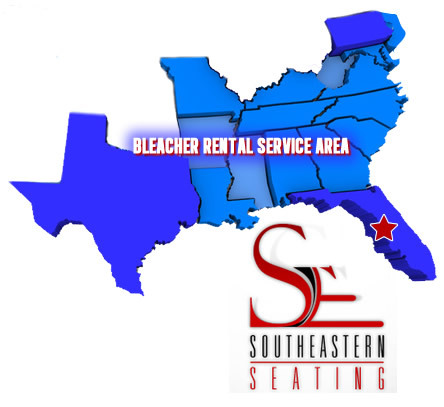 Southeastern is also a nationwide outdoor aluminum bleacher seating manufacturer. Since we produce our own material we are able to distribute savings onto our customers pricing. We offer assistance in your design seating needs, temporary or permanent. Interested in renting bleachers now and purchasing later? Southeastern’s sales inventory includes new bleachers and also used stock at discounted rates. We also can discount a purchase for past rental customers. Aluminum rental bleachers inventory comes in both 15 foot and 21 foot increments, joining bleachers together increases the amount of seating.